procedures, etc. related to your belongings when you move overseas. When shipping your belongings overseas, in principle, your goods will not incur import duty if declared as household goods. However, the following conditions need to be met for your goods to be exempt from import duty. If the conditions are not met, your goods will incur import duty, even if they are used items (not newly purchased items). You must have resided in Japan for at least 6 months. (Note: A tourist visa is not acceptable.) Your goods are for personal use (not for sale) and are necessary for living overseas. You must have a valid permit (visa, etc.) or in the process of acquiring a valid permit to reside in the country to which you will be sending your goods. (Note: A tourist visa is not acceptable.) You will be going to the country to which you will be shipping your goods. Your goods must arrive in the country within the first 6 months after you enter the country. Your belongings can be declared as household goods. When shipping your household goods by sea, the cost is determined by the volume of your goods. The minimum volume size that we offer is 1m³ (35cft), which is seven of our C size boxes. When we send your belongings by sea, we palletize your boxes and protect them further with exterior packing. The measurements of the final pallet are what we use when calculating the size of your shipment. This volume is referred to as the Gross Volume. When shipping items by air, the cost is determined by the weight of each box. The actual physical weight is referred to as the gross weight. The average weight for each standard box is also important when sending light items that take up a lot space. This is referred to as the volumetric weight and is calculated by the following formula: length (cm) x width (cm) x height (cm) divided by 6,000 (cm). The heavier of the two is referred to as the chargeable weight and is what is used when determining the cost. The chargeable weight is the volumetric weight in this case, as it is the larger of the two. * When sending multiple boxes, the gross weight of each box and the sum of the volumetric weight of each box is marked up. Whichever sum is larger becomes the chargeable weight. 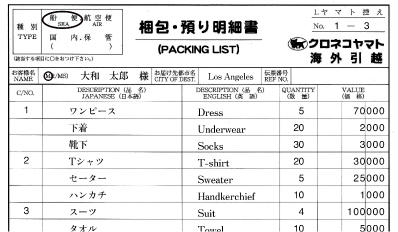 The following documents will be necessary for clearing customs in Japan when shipping your goods overseas. Other documents may be necessary depending on where you are shipping your household goods. Please check with our staff.  Please check with our staff for information regarding the necessary documents for the import customs process as the rules differ according to each country. * We recommend that you hand in the paperwork to our staff in Japan, if you can prepare them in advance, as it will make the customs process smoother. Having to prepare all the necessary documents once you arrive overseas can be time-consuming, and difficulty in contacting us can delay the process. Although we take great care to ensure that your goods arrive safely, due to the possibility of unforeseen circumstances, Marine Cargo Insurance is applied when sending your belongings overseas. The insured value is the value of your household goods at the time that they are shipped. Therefore, the insured value should reflect the depreciation in value from the original value at the time the item was purchased. The insurance value for each item is the value listed on the packing list. Please note that when the values listed on the packing list are considered high by the customs officers, they may decide to apply import duty. If your goods do incur import duty at customs, the values listed on the packing list will be used by the customs officers when calculating the import duty. aerosols, fireworks, guns (models included), swords (models and stun guns included)、flammable items, matches, lighters, gas canisters, etc. Including these items in your shipment will delay delivery of your goods, as they will need to be inspected at customs. We kindly ask that you take these items with you in your carry-on. 7～14 50～60 • Depending on the city, the necessary documents differ. Please confirm with our staff. • Copies of passports and visas of all family members may be necessary. • No food items are permitted due to the Bioterrorism Act of 2002. 7～10 40～45 • Your presence is normally required at the customs office for customs clearance of unaccompanied baggage (including household goods). However, under certain conditions we can act as your agent instead. Please ask us for details. • Shipments that pass through U.S. ports are subject to inspection at U.S. customs. Please note that due to the U.S. Bioterrorism Act of 2002, no food items are permitted. 10～14 60～65 • Food items and new electrical goods are subject to import duty. The customs process will take longer if these items are included as they will be inspected. Please note that your shipment may arrive later than your desired delivery date due to the delays. 7～10 60～70 • Food items and new electrical goods are subject to import duty. The customs process will take longer if these items are included as they will be inspected. Please note that your shipment may arrive later than your desired delivery date due to the delays. • Due to EU regulations, we only accept electrical goods with the CE mark of approval. 7～10 60～70 • For customs clearance, a copy of your boarding pass is required. (Please be sure to make a copy of your boarding pass after your arrival in Germany.) As a copy of your certificate of residence is also required, we kindly ask that you complete the necessary procedures as soon as you can. 10～14 55～60 • Cordless telephones and fax machines made in Japan without the CE mark of approval are illegal and subject to a fine (minimum of 250 euros) and criminal charges. Please be sure not to include them in your shipment. • Food items and new electrical goods are subject to import duty. 7～10 60～65 • Food items and new electrical goods are subject to import duty. The customs process will take longer if these items are included as they will be inspected. Please note that your shipment may arrive later than your desired delivery date due to the delays. Please ask • Please check with us regarding the necessary documents as they vary depending on your visa status and the size of your shipment. Please also be aware that the rules often change. 7～10 20～25 • Compared to other regions, there are not many import restrictions for Hong Kong. However, the universal restrictions mentioned in the section above do apply. 7～10 30～35 • There are strict regulations for importing video media. If you wish to include videos (DVDs, videos, etc.) in your shipment, you will need to prepare the necessary forms. There will be an inspection fee and the inspection process will take up to a month. 10 40 • There are strict regulations for importing video media. If you wish to include videos (DVDs, videos, etc.) in your shipment, there will be an inspection fee and a significant delay in the customs process. 8 20～25 • For customs clearance, a copy of your entrance stamp is required. (You will receive an entrance stamp on your passport when you enter Taiwan.) Please kindly send a copy to our Taiwan office once you arrive. * The above average number of days required is an estimate based on the assumption that all the necessary documents are submitted on time. * The number of days required may vary significantly due to delays by container shipping companies (or air cargo companies) and delays in the customs process. Please keep the following points in mind should you do any of the packing yourself. First fold the small flaps and then the large flaps on the bottom of the box. Tape along the seam where the large flaps meet. Next tape along the edges on both sides (where the small flaps were folded over). Turn the box over and it is ready to pack. * Please do not prepare the box by folding small and large flaps alternately. Place on a towel or newspaper and wrap away from you. Next wrap the base and then insert the wrapping inside to protect the rim. Be sure to place dishes vertically, glasses upside down, and bottles right-side up. Wrap each individual item in a towel or some other form of wrapping, and ensure that they do not knock against each other by placing soft material in any gaps between them. Make sure that any protruding parts such as handles are protected. For items with lids (teapots, etc. ), turn the lid upside down and place newspaper between the lid and pot to prevent breakage. Breakages can occur when boxes are packed incorrectly. For example, if the box is packed so full that it bulges, or a rattling sound can be heard when shaken, it will need to be repacked. Either reposition the contents of the box or remove some of the contents so that the box does not bulge or rattle. Please number each box on its top and all four sides. Write “FRAGILE” on the top of the box in red marker if it contains breakable items. Please confirm the details about transporting your beloved pets at the web site of the Ministry of Agriculture, Forestry and Fisheries.